His History of the Jewish War. Historical writer and one of the leaders of the Jews against the Romans in Galilee in the year 66. What is known of him comes mostly from his political and literary enemy, Josephus Flavius; so that an exact biography of him can not be given. He was a man of Greek education and of moving eloquence. By his oratorical ability he prevailed on the Tiberians, who felt themselves slighted by the favor which Agrippa II. and Rome had shown at their expense to the people of Sepphoris, to revolt. An unnamed brother helped him in this task. With his followers Justus burned the villages that belonged to Gadara and Hippos (Josephus, "Vita," § 9), whose people had always been ill-disposed toward the Jews. Soon afterward Josephus came as governor to Galilee, and he persuaded the chief people of Tiberias, among them Justus, to demolish the palace of Herod the Tetrarch because it was ornamented with figures of animals. Josephus himself says he had to force the people to it (ib. § 12). From this it follows conclusively that the actual rebellion in Galilee was instigated mainly by Josephus rather than by Justus. Later, out of fear of the Romans, neither historian wished to admit in his writings his part in the matter; and each blamed the other. Even at the beginning of the war the Tiberians, and especially Justus and his father, Pistus, wished to break with Josephus andto attach themselves to John of Giscala, but Josephus frustrated the plan (ib. § 17). At one time Josephus caused the Tiberians who had been arrested, among them Justus and Pistus, to be taken out of prison; and while eating with them he suggested that it would be wiser for them to surrender to the Romans at a suitable opportunity. He reminded Justus that before he (Josephus) had entered on his office, the brother of Justus had had his hands cut off by the Galileans, who claimed that he had forged letters, and that furthermore Jesus, Justus' sister's husband, had had to suffer from anarchy. The next day he let Justus and his followers go free (ib. § 35). Jesus and the sister of Justus were killed in Gamala (ib. § 37). Still Justus continued to agitate against Josephus (ib. § 54). When Galilee was subdued, the inhabitants of Decapolis, primarily those of Gadara and Hippos, denounced Justus before Vespasian, and demanded his punishment. Agrippa was ordered to put him to death; but on the plea of his sister Berenice he merely imprisoned him (ib. §§ 65, 74). 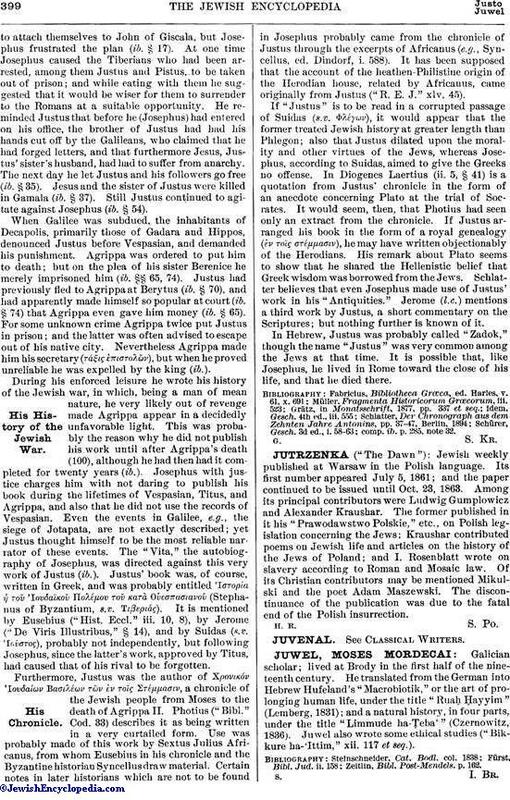 Justus had previously fled to Agrippa at Berytus (ib. § 70), and had apparently made himself so popular at court (ib. § 74) that Agrippa even gave him money (ib. § 65). For some unknown crime Agrippa twice put Justus in prison; and the latter was often advised to escape out of his native city. Nevertheless Agrippa made him his secretary (τάζις ἐπιστολῶν), but when he proved unreliable he was expelled by the king (ib.). During his enforced leisure he wrote his history of the Jewish war, in which, being a man of mean nature, he very likely out of revenge made Agrippa appear in a decidedly unfavorable light. This was probably the reason why he did not publish his work until after Agrippa's death (100), although he had then had it completed for twenty years (ib.). Josephus with justice charges him with not daring to publish his book during the lifetimes of Vespasian, Titus, and Agrippa, and also that he did not use the records of Vespasian. Even the events in Galilee, e.g., the siege of Jotapata, are not exactly described; yet Justus thought himself to be the most reliable narrator of these events. The "Vita," the autobiography of Josephus, was directed against this very work of Justus (ib.). Justus' book was, of course, written in Greek, and was probably entitled Ιστορία ἡ τοῦ Ιουδαϊκοῦ Πολέμου τοῦ Οὐεσπασιανοῦ (Stephanus of Byzantium, s.v. Τιβεριάς). It is mentioned by Eusebius ("Hist. Eccl." iii. 10, 8), by Jerome ("De Viris Illustribus," § 14), and by Suidas (s.v. Ιοῦστος), probably not independently, but following Josephus, since the latter's work, approved by Titus, had caused that of his rival to be forgotten. Furthermore, Justus was the author of Ξρονικόν Ιουδαίων Βασιλέων τῶν ἐν τοῖς Στέμμασιν, a chronicle of the Jewish people from Moses to the death of Agrippa II. Photius ("Bibl." Cod. 33) describes it as being written in a very curtailed form. Use was probably made of this work by Sextus Julius Africanus, from whom Eusebius in his chronicle and the Byzantine historian Syncellus draw material. Certain notes in later historians which are not to be found in Josephus probably came from the chronicle of Justus through the excerpts of Africanus (e.g., Syncellus, ed. Dindorf, i. 588). It has been supposed that the account of the heathen-Philistine origin of the Herodian house, related by Africanus, came originally from Justus ("R. E. J." xlv. 45). If "Justus" is to be read in a corrupted passage of Suidas (s.v. 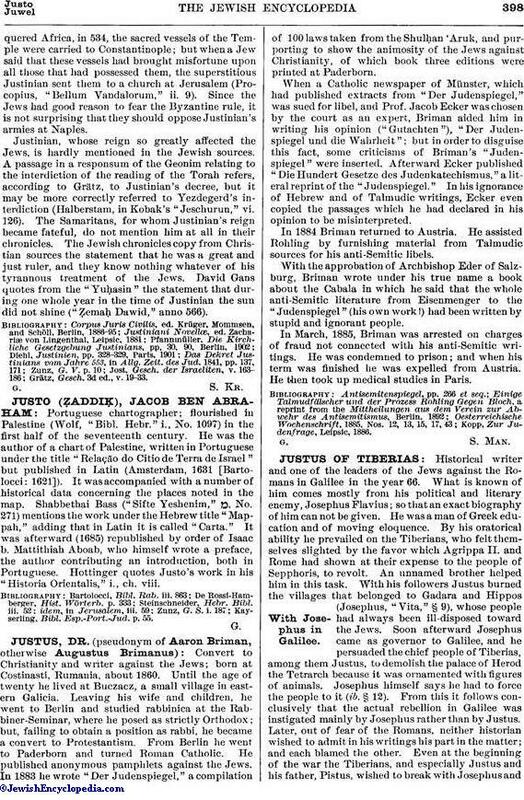 πλέγων), it would appear that the former treated Jewish history at greater length than Phlegon; also that Justus dilated upon the morality and other virtues of the Jews, whereas Josephus, according to Suidas, aimed to give the Greeks no offense. In Diogenes Laertius (ii. 5, § 41) is a quotation from Justus' chronicle in the form of an anecdote concerning Plato at the trial of Socrates. It would seem, then, that Photius had seen only an extract from the chronicle. If Justus arranged his book in the form of a royal genealogy (ἐν τοῖς στέμμασιν), he may have written objectionably of the Herodians. His remark about Plato seems to show that he shared the Hellenistic belief that Greek wisdom was borrowed from the Jews. Schlatter believes that even Josephus made use of Justus' work in his "Antiquities." Jerome (l.c.) mentions a third work by Justus, a short commentary on the Scriptures; but nothing further is known of it. In Hebrew, Justus was probably called "Zadok," though the name "Justus" was very common among the Jews at that time. It is possible that, like Josephus, he lived in Rome toward the close of his life, and that he died there. Schürer, Gesch. 3d ed., i. 58-63; comp. ib. p. 285, note 32.